Derived from either the Olde English pre 7th century word 'hereborge' or the similar Old French word 'herberge', this surname is English. 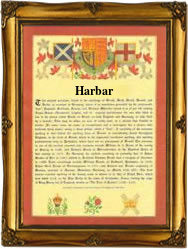 Translating as 'harbour,' the surname is either occupational for a person who kept a lodging house or inn and therefore in a sense provided a safe harbour, or it may be topographical for somebody who lived by a harbour, meaning a place where ships anchored. Strictly speaking the original word is probably Scandanavian from 'heve', meaning army, and 'beorg', shelter, a place where an army could shelter. In the Middle Ages the term began to be used in the modern sense of a safe anchorage. In the modern idiom the surname has a number of spellings including Harbar, Harber, Harbour, Harberer, and Harbisher, with as an example George Harbar, who was christened at the church of St. Mary Steps, in the city of Exeter, Devonshire, on the 3rd December, 1635. The first recorded spelling of the family name is shown to be that of Geoffrey Herbour. This was dated 1279, in the Hundred Rolls of lamdowners for the county of Berkshire during the reign of King Edward 1st of England, 1272-1307. Surnames became necessary when governments introduced personal taxation. In England this was sometimes known as the Poll Tax. Throughout the centuries, surnames in every country have continued to "develop" often leading to astonishing variants of the original spelling.